Sérum Matriciel Visage addresses one of the most complex and inescapable problems: the gradual collapse of the face. 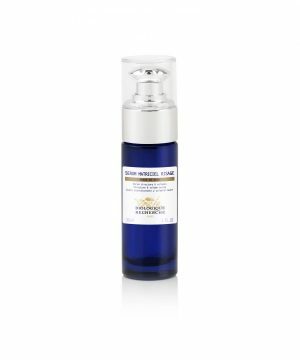 Using more than 10 active ingredients, this serum combines a double action. It not only provides intensified volume and fills facial hollows, but it also acts as a surface tensor with immediate and lasting results. Intensely hydrating as it is also packed with Hyaluronic Acid, this firming care product combats the effects of gravity and the atrophy of adipose and muscle tissues to rebalance the area of the cheekbones, cheeks and jowls, neck and the oval of the face. Ideal for distended Skin Instants® lacking structure and tone. Distended Skin Instants® lacking structure and tone. Restructuring agents: Glycoprotein from the Antarctic, Rye extract, Knotgrass flavonoids. Epidermis/dermis/hypodermis communication agents: Peony extract, Tetrapeptide-11. Tightening agents: Cassava extract, Planktonic exopolysaccharide, Hyaluronic acid.